AllegroMedical.com presents The Sa-Wan Herbal Ball (2 Pack). Soft muslin fabric, filled with traditional Thai herbs and spices including lemongrass, turmeric, parai, kaffier lime, camphor and tamarind. Each is hand tied. Heat sealed for freshness. Small balls, 50 g each, are ideal for facial treatments and large balls, 150 g each, are perfect for body treatments and massage. 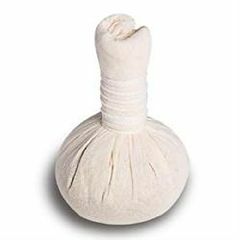 The herbal ball treatment is traditionally a hot treatment. The Sa-Wan Ball is soaked for five minutes, and then steamed in a steamer for 10-20 minutes before use. It is pressed along the Sen Sib lines, or acupressure zones of the body in a series of motions that include: a pressing with steady downward pressure: a 'rock 'n roll,' or back and forth motion: a 'rolling' or orbital circular motion: and a ' dragging' motion which is used to increase blood flow and lymphatic drainage. The Sa-Wan ball is used in combination with traditional Thai or Swedish massage or as a tool to work on specific parts of the body that need special attention for muscular tightness or pain.